Set within a charming period conversion, this lovely one bedroom second floor flat comprises a bright reception room, separate kitchen and a well proportioned bedroom. Close to the popular "Ravenscourt Park"
Goodwin Road is a quiet residential address close to a variety of local shops and amenities on Goldhawk Road. Whilst motorists will find easy access to the A4/M4 for routes into and out of London. A family run café that even has a loyalty offer of buy 8 breakfasts and get 1 free! An extremely friendly father and son team who make you feel welcome in the local area. Jamie Oliver's cookery school offers a fantastic range of cooking classes to suit all ages and abilities.There's lots to see and do! Perfect for after work drinks or a bite to eat before a gig at the O2 empire, theres a laid back vibe and they have a DJ at the weekends. 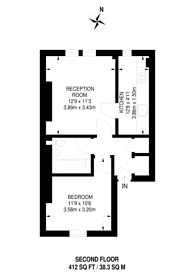 412 (38 Sq M) approx. How is the property market performing in W12? We have over 1,000 property market reports for locations across London and Surrey - including W12 and Shepherd's Bush.